Social phobia (social anxiety disorder) refers to one of the most common anxiety disorders, with lifetime and 12-month prevalence rates to reach approximately 12 and 7% respectively. The disorder may appear early in life, especially during adolescence, it may comorbid with other anxiety, mood, and substance use disorders, while females seem to be more vulnerable in developing the disorder. Its key feature refers to the experience of excessive and persistent fear as elicited by social or performance evaluative situations leading to avoidance behaviors or to the experience of significant distress, consequently resulting in detrimental effects in one’s social, occupational and daily life. From a developmental perspective, temperamental traits and familial patterns seem to interact with environmental factors (such as overprotecting, over-controlling, and negative parenting styles, as well as aversive social experiences) accounting for the appearance and development of the disorder. Also, maladaptive cognitions and behaviors exhibited by people with social phobia contribute to the maintenance of the disorder. Finally, evidence-based efficacious treatments of the disorder are discussed, referring to medication (SSRI’s & Benzodiazepines) and therapeutic interventions (cognitive-behavioral therapies, interpersonal therapy, acceptance & commitment, and mindfulness-based therapies). Social Phobia (Social Anxiety Disorder) refers to an anxiety disorder characterized by an individual’s experience of significant fear or distress as elicited by his or her exposure to social or performance evaluative situations, often driving in social avoidance behaviors (American, Psychiatric Association, 2000; APA). Social phobia has an early onset age, it can take a chronic form (Kessler, 2003) and it can lead to severe social and interpersonal functional impairment (Ruscio et al., 2008). The key feature of social phobia is the considerable and persistent fear of being negatively evaluated by others, or of being embarrassed in the presence of others. According to the Diagnostic and Statistical Manual of Mental Disorders (4th ed., text rev. ; DSM-IV-TR; APA, 2000), the following criteria should also be met in order for a diagnosis of the disorder to be given : (a) the anxiety response is evoked as a rule by the exposure to the social or performance situation, (b) the individual understands that his or her fear is excessive or unreasonable, (c) the fear leads to the avoidance or to the endurance of the social or performance situation with dread, (d) which in turn results in significant functional impairment in an individual’s daily routine, occupational and social life, or causes marked distress about having the phobia. Additionally, the experienced fear or distress must not be caused by a general medical condition or substance use and should not be better explained by another mental disorder. Finally, for people diagnosed with social phobia that are under 18 years, these symptoms must be present for at least 6 months, as experiences of temporal social anxiety are very common during adolescence and childhood. For children, the diagnostic criteria for social phobia are modified as to include evidence of children’s ability to form age-appropriate social relationships, while social anxiety must occur during interactions with peers and not just with adults. Moreover, the behavioral manifestation of social anxiety in children can take the form of crying, tantrums, freezing or reticence during unfamiliar social interactions, while the cognitive aspect of realizing that the fear is unreasonable may be absent. Cross-cultural epidemiological studies indicate that social phobia is one of the most common anxiety disorders, with lifetime prevalence rates varying from 7 to 12% (Witthcen & Fehm, 2003). A recent study by Ruscio et al. (2008) in adult US population, showed lifetime and 12-month prevalence rates to be 12.1% and 7.1% respectively, consistent with findings from a previous study reporting social phobia to the second most prevalent disorder behind specific phobias and with a 12-month prevalence of 6.8% (Kessler, Chiu, Demler, & Walters, 2005). Concerning gender differences, women as compared with men, appear to be at higher risk for developing the disorder (Kessler et al., 2005). Also, young women diagnosed with social phobia tend to report a larger number of social fears, while men are more likely to report lifetime experiences of 1 to 4 social fears (Ruscio et al., 2008). Additionally, the self-reported number of social fears varies depending on other socio-demographic characteristics, with being younger, single or previously married, being unemployed or disabled, and having a lower educational level all linked with the perseverance of more social fears (Ruscio et al., 2008). DSM-IV-TR, depending on the number and situations of self-reported social fears, distinguishes between generalized and specific or non-generalized social phobia, the former referring to people feared of both public performance and social interactions, and the latter to individuals consisting of a heterogeneous group reporting to have one or several, but not most, social fears. Based on this distinction, it was found that for people diagnosed with social phobia, approximately 71% of them tend to fall into the generalized category reporting 8 or more social fears in both public performance (speaking up in class/meeting, public speaking/performance, important exam/interview, working while being watched, writing/eating/drinking while being watched, using public bathroom) and social interaction situations (meeting new people, talking to people in authority, going to parties, entering an occupied room, talking with strangers, expressing disagreement, and dating situations), while 24.1% reported to have experienced at least one lifetime social fear, with public speaking, speaking up in a class/meeting and meeting new people being the most common ones (Ruscio et al., 2008). However, it must be noted that the existence in the DSM-IV-TR of the distinction between the two subtypes of social phobia (generalized and specific or non-generalized) has gone through criticism especially due to the not clearly defined threshold of differentiation between the two types (leading to various operational definitions used in studies), as well as due to empirical findings suggesting that many of the differences found across people with social phobia represent various degrees of severity and not categorical distinctions of different types of the disorder (Bogels et al., 2010). As such, it was found that the severity of experienced social fears is positively associated with an individual’s self-reported number of fears, further linking with increased functional impairment, particularly in social life and close relationships (Ruscio et al., 2008). People who meet the criteria for a social phobia diagnosis represent a group of people with associated behavioral, physiological and cognitive symptoms. Regarding the behavioral symptoms, a large proportion of socially phobic individuals try to avoid the feared social interactions or public performance situations (Heiser, Turner, Beidel, & Roberson-Nay, 2009), while those who endure them are more likely to exhibit poor social skills (Moitra, Herbert, & Forman, 2008; Voncken & Bogels, 2008), express safety behaviors such as monitoring one’s speech and avoiding eye contact (McManus, Sacadura, & Clark, 2008), as well as presenting other overt signs of distress such as low and shaky speaking voice (Heiser et al., 2009). Physiological and somatic symptoms refer to increased heart rate, tremors, sweating, muscle tension, stomach upset, which in cases of severe social phobia these may end up in a full blown panic attack (DSM-IV-TR). Blushing also is one of the core physiological symptoms in social phobia, functioning together as an overt sign of anxiety and arousal, as well as a cue for increasing fear of embarrassment (Gerlach, Wilhelm, Gruber, & Roth, 2001). Finally, cognitive features of the disorder refer to self-perceptions of low self-esteem, increased sensitivity to criticism, negative evaluation and rejection (DSM-IV-TR), as well as to increased self-focused attention (McManus et al., 2008) and cognitive distortions regarding negatively biased perceptions of one’s social performance and audience’s feedback (Ashbaugh, Antony, McCabe, Schmidt, & Swinson, 2005; Vocken & Bogels, 2008). Social phobia shows high prevalence rates of comorbidity with other mental disorders. Findings from cross-cultural studies displayed that 50 to 80% of clinical patients diagnosed with social phobia had exhibited at least one other mental disorder, particularly other anxiety disorders, mood disorders and substance use disorders (Wittcehn & Fehm, 2003). Also, empirical findings suggest that the co-occurrence of social phobia with anxiety, mood, impulse control , and substance use disorders is positively associated with the self-reported number of social fears (Ruscio et al., 2008), particularly panic disorder, agoraphobia, specific phobias, major depression, dysthymia (Kessler et al., 2005), and nicotine and alcohol dependence (Wittchen & Fehm, 2003). Concerning temporal comorbidity, social phobia was found to be a predictor of later appearing depression (Beesdo et al., 2007), with the risk for later developing depression being positively associated with an earlier onset age of social phobia (Beesdo et al., 2007; Dalrymple & Zimmerman, 2011). Also, social phobia was found to predict later substance abuse (Ruscio et al., 2008). Additionally, people with chronically enduring patterns of comorbidity of social phobia with another disorder are thought to be at higher risk for suicidal ideation and suicidal attempts (Wittchen & Fehm, 2003), especially those with an early appearing comorbidity patterns of depression and social phobia (Dalrymple & Zimmerman, 2011). Finally, relevant studies have shown that generalized social phobia symptoms significantly overlap with those of avoidant personality disorder, further suggesting the latter to represent a most extreme manifestation of social phobia with severe social functional impairment and social avoidance (Bogels et al., 2010). Also, it is proposed by DSM-IV-TR that people diagnosed with generalized social phobia, should also be considered for an additional avoidant personality disorder diagnosis. However, the existence of discriminating empirical evidence between social phobia and avoidant personality disorder may imply that these two disorders are not simply placed along a continuum; instead, there should be qualitatively differences between the two, with avoidant personality being potentially a part of a schizophrenia spectrum of disorders (Bogels et al., 2010), as its key characteristic is the misinterpretation of informational cues in ordinary situations as cues for potential dangers (Wells, 2000). Social phobia may appear as early as in childhood, with early and mid-adolescence being the developmental periods associated with more incidences of social phobia onsets (Rapee, Schniering, & Hudson, 2009). Afterwards incidences are thought to decline and to become rare post to the 21st year of life (Beesdo et al., 2007). During childhood and adolescence, the onset of social phobia is suggested to be positively associated with early appearing temperamental traits, such as behavioral inhibition and low effortful control. Specifically, temperamental inhibition is linked with a higher vulnerability for developing social phobia during middle childhood and adolescence (Rapee, 2010), while a combination of behavioral inhibition with low effortful control (indicating the degree to which an individual is capable of managing and controlling his or her negative emotions, especially through voluntary selective attention to negative cues) also place an additional risk for later developing anxiety disorders (Rodebaugh & Heimberg, 2008, as cited in Rapee, 2010). However, although these temperamental traits may increase an individual’s vulnerability, are not enough to solely account for the appearance of social phobia, as familial patterns, parent child relationships, and individual’s negative social experiences in peer settings may also contribute to or trigger the appearance of the disorder. Concerning familial patterns, it has been found that socially phobic adults are more likely, compared to non-phobic ones, to have first degree biological relatives who also have the disorder, a linkage that is mainly evident in generalized social phobia (APA, 2000; Fyer, Mannuzza, Chapman, Martin, & Klein, 1995, as cited in Rapee, 2010). Additionally, overprotecting, over-controlling and negative parenting styles are also suggested to influence the appearance of social phobia in adolescents, while depression and social phobia diagnosed in parents have also be linked with an early onset of social phobia (Lieb et al., 2000). Accordingly, negative social experiences with peers, such as teasing and bullying might work as aversive conditioning experiences contributing to the appearance of the disorder. In a study by McCabe, Antony, Summerfeldt, Liss, and Swinson (2003) it was found that 92% of adults diagnosed with social phobia reported to have experienced cases of being severely teased or bullied during their childhood and adolescence, while these negative experiences were associated with earlier onset ages of the disorder. Bullying and peer rejection have also been associated with the expression of the disorder in adolescence, together with the appearance of patterns of comorbidity of social phobia and depression (Ranta, Kaltiala-Heino, Pelkonen, & Marttunen, 2009). 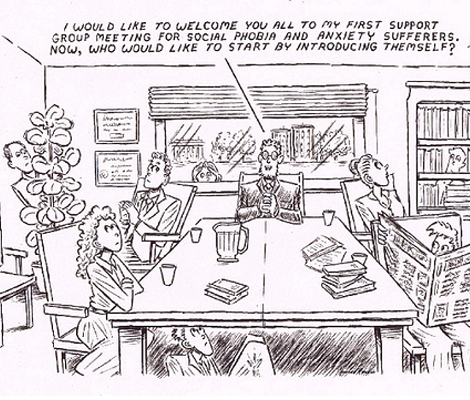 Additionally to the developmental perspective of social phobia, certain cognitive theories (Clark, 2001; Rapee & Heimberg, 1997) have been proposed in an attempt to explain the anxiety experienced by socially phobic people and their cognitive processes during social interactions and social performance situations that maintain this anxiety. These theories postulate that people who have the disorder hold and maintain certain distorted assumptions and beliefs, and specifically that: (a) being always positively appraised by others is of quite significant importance, (b) their social performance should reach excessively high standards, (c) other people are inherently judgemental, (d) performing in a certain way will elicit negative responses by others, and (e) the self-perceived view of their self is likely to be biased in a negative direction. Consequently, social interactions and social performance situations are interpreted be socially phobic individuals as potential social threats that increase the probability for these people to be humiliated or embarrassed. By entering the feared social situation the above assumption are being activated, driving person’s attention to his/her own social performance and to potential threats in the social environment (Clark, 2001; Rapee & Heimberg, 1997). Specifically, person’s attention focuses on 3 set of cues: (a) those retrieved from long-term memory, representing past social experiences, (b) internal cues, referring to physical symptoms being experienced prior and during the social encounter, and (c) external cues referring to audience’s feedback (Rapee & Heimberg, 1997). These series of cues are being processed in a negative and self-diminishing way, that in turn give rise to a re-emerging set of physiological-somatic, behavioral and cognitive symptoms that further maintain the anxiety experienced during the social situation. Behaviorally, this intense anxiety may lead to the avoidance of fearful social situations or to the endurance of them by utilizing a set of maladaptive safety behaviors (avoidance of eye contact and self-disclosure, planning of what to say and mentally rehearsing sentences, etc. ; Clark, 2001) that further contribute to information processing biases, increased self-consciousness, and elevated anxiety levels. Additionally, two more judgemental-biased processes may occur before (anticipatory processing) and after (post-event processing) the social encounter, the former referred to negative thoughts and feelings of worry preceding the interaction, and the latter consisting of negative evaluating thoughts and self-attributable, self-diminishing judgemental biases following the interaction, that further enhance the existence of a self-repeating cycle of maladaptive behaviors, feelings and cognitions (Clark, 2001). Consistent with the aforementioned cognitive models of social phobia come research findings giving support to the features of the models. As such, safety behaviors as well as increased self-focused attention characterize socially anxious people and lead to elevated anxiety levels, to biased negative interpretations of poorer social performance and to false perceptions of appearing more anxious to others (McManus et al., 2008). Moreover, safety behaviors are associated with negative self-judgements about both current and future social events, further positively influencing the maintenance of social fears (Taylor & Alden, 2010). People with the disorder also tend to overestimate the magnitude of their social skills deficits and the way these are negatively perceived by others (Ashbaugh et al., 2005). Especially, for adults with generalized social phobia who also had a developmental history of parental hostility, their information processing biases, apart from leading to negative self-judgements, extent also to perceiving others as being less friendly. Additionally, those with childhood experiences of parental overprotection seem to be less sensitive to changes in the behavior of others, and thus less able to detect any positive social cues (Taylor & Alden, 2005). Finally, evidence for anticipatory biased cognitive processing comes from a study showing that socially anxious people are less able to forget past aversive social experiences (Gomez-Ariza et al., 2012), while post event processing of socially phobic individuals is associated with increased dysfunctional self-consciousness that further intensify the disorder (Fehm, Hoger, Schneider, Lidemann, & Klusmann, 2008). Treatments for social phobia that have demonstrated adequate efficacy generally refer to pharmacological and psychological interventions. Pharmacological interventions aim at reducing symptoms of anxiety experienced by socially phobic individuals in order to further reduce the avoidance behaviors and consequent impairments in their social life, by influencing certain neurotransmitters associated with the disorder. As such, medication includes selective serotonin reuptake inhibitors and benzodiazepines in order to affect serotonin levels and gamma-aminobutyric acid (GABA), respectively, as both are thought to be linked with emotional regulation, affection control, and anxiety responses (Rodebaugh & Heimberg, 2005). In the short term, pharmacological treatments for social phobia have shown better efficacy than psychotherapeutic interventions (Fedoroff & Taylor, 2001, as cited in Rodebaugh, Holaway, & Heimberg, 2004) in reducing symptoms of the disorder, however they are also associated with elevated rates of relapse, ranging from 30% to 60%, following the discontinuance of the medication (Rodebaugh & Heimberg, 2005). On the other hand, psychological treatment for social phobia refers to psychotherapeutic interventions including cognitive-behavior therapies (CBTs), interpersonal therapy, as well as mindfulness-based therapies (mindfulness-based cognitive therapy and mindfulness-based stress reduction) and acceptance and commitment therapy. Among these, CBTs have shown to be the most efficacious, with relapse rates approximately at 17% (Rodebaugh & Heimberg, 2005), while their effects in reducing symptoms and functional impairment are thought to be significant and maintained even 5 years after treatment (Mörtberg, Clark, & Bejerot, 2011). Cognitive-behavior therapies include a series of techniques, such as exposure (hierarchical in vivo or imagery experiences of feared social situations in and out of sessions, aiming at reducing avoidance and safety behaviours by creating new learning experiences competing with the original fear responses), applied relaxation (progressive muscle relaxation aiming at reducing physiological arousal), social skills training (inducing social skills through the implementation of modelling, behavioural rehearsal, corrective feedback, and positive reinforcement techniques), and cognitive restructuring (aiming at identifying and challenging automatic negative thoughts and beliefs in order to alter individual’s cognitive processes that produce anxiety and distress in response to social feared stimuli). These techniques are based on the cognitive theories of social phobia, they can be used alone or in conjunction with each other, and they can be applied either in individual or group therapy sessions. All they have shown to be quite effective in helping people modify their dysfunctional beliefs and behaviours, overcome their social anxiety, and maintain in the long term the gains obtained from therapy. Especially, the combination of cognitive restructuring and exposure techniques is thought to produce the largest effects, as compared to the rest of techniques (Rodebaugh et al., 2004). Whereas cognitive-behavior therapies focus on modifying certain maladaptive assumptions and beliefs, interpersonal therapy, as an alternative therapeutic approach to social phobia, aims at identifying and modifying problematic patterns of interpersonal relationships thought to influence the maintenance of social anxiety (Alden & Taylor, 2004; Lipsitz et al., 2008). Specifically, in the context of interpersonal therapy, social anxiety symptoms are related to certain dysfunctional areas of interpersonal relationships (especially client’s deficits as experienced in certain interpersonal relationships, as well as difficulties in role transitions portrayed in his or her relationships), while client’s roles and associated emotions that take place in these areas are also clarified. The client is then advised and encouraged to explore, identify, express and communicate his or her feelings in order to be able to form and maintain a satisfactory social network of close and trusting relationships that will facilitate in overcoming his or her social anxiety (Lipsitz et al., 2008). In a study by Stangier, Schramm, Heidenreich, Berger, and Clark (2011) comparing the effectiveness of cognitive and interpersonal therapy in the treatment of social phobia, it was found that although cognitive therapy had significantly better effects than interpersonal therapy in response rates (68% and 42.1% respectively) and in reducing disorder’s symptoms, both treatments led to considerable improvements sustained 1 year after the termination of the therapy. Mindfulness-based cognitive and stress reduction therapies constitute another form of treatment for social phobia offering useful and low cost therapy options in reducing symptoms of the disorder and in restoring an individual’s social functionality, however showing less efficacy as compared to cognitive behavioral therapies (Piet, Hougaard, Hecksher, & Rosenberg, 2010). Mindfulness-based therapies combine relaxation techniques derived from ancient Buddhist and Yoga practices together with cognitive interventions aiming at self-regulating ones attention towards ones present experiences further promoting ones awareness and acceptance of the present moment as experienced in a non-judgmental and open way. Such orientation can alleviate feelings of anxiety associated with past and future thoughts and it can further facilitate people cope with stressors without employing avoidance strategies (Hofmann, Sawyer, Witt, & Oh, 2010). Finally, acceptance and commitment therapy integrating strategies from humanistic, experiential and cognitive-behavioral approaches, as well as mindfulness-based techniques promoting awareness and acceptance of internal and external experiences, can be utilized for the treatment of social phobia (Dalrymple & Herbert, 2007). Acceptance and commitment therapy includes a series of stages through which an individual is encouraged to experience and nonjudgmentally accept previously avoided painful situations or feelings, to relate to his or her thoughts in a more functional and less negative emotional way, to learn to directly experience events and feelings, to clarify personal values and goals and finally to commit to behaviors that are in accordance with these values. Symptom reduction is not the core aim of the treatment, but it emerges as a by-product of the general change in behavioral, experiential and cognitive level (Hayes, Luoma, Bond, Masuda, & Lillis, 2006). In a pilot study (Dalrymple & Herbet, 2007), acceptance and commitment therapy for generalized social phobia combined with exposure therapy led to decreased experiential avoidance in social situations, to a significant reduction in the severity of other symptoms related with the disorder, to increased social skills, and to an overall improvement of the self-perceived quality of life through greater achieved personal control over emotional reactions and external events. However, more empirical evidence is suggested to be accumulated in order to further assess and evaluate the utilization and the efficacy of this type of therapy in the treatment of social phobia, as compared to other relevant therapeutic approaches (Dalrymple & Herbet, 2007). American Psychiatric Association (2000). Diagnostic and statistical manual of mental disorders, 4th edition, text revised (DSM-IV), Washington, DC: American Psychiatric Association. Beesdo, K., Bittner, A., Pine, D. S., Stein, M. B., Hofler, M., Lieb, R., & Wittchen, H. (2007). Incidence of social anxiety disorder and the consistent risk for secondary depression in the first three decades of life. Archives Of General Psychiatry, 64(8), 903-912. Clark, D. M. (2001). A cognitive perspective on social phobia. In W. Crozier, L. E. Alden (Eds.) , International handbook of social anxiety: Concepts, research and interventions relating to the self and shyness (pp. 405-430). New York, NY US: John Wiley & Sons Ltd.
Fehm, L., Hoyer, J., Schneider, G., Lindemann, C., & Klusmann, U. (2008). Assessing post-event processing after social situations: A measure based on the cognitive model for social phobia. Anxiety, Stress & Coping: An International Journal, 21(2), 129-142. Piet, J., Hougaard, E., Hecksher, M. S., & Rosenberg, N. K. (2010). A randomized pilot study of mindfulness-based cognitive therapy and group cognitive-behavioral therapy for young adults with social phobia. Scandinavian Journal Of Psychology, 51(5), 403-410. Rapee, R. M. (2010). Temperament and the etiology of social phobia. In K. H. Rubin, R. J. Coplan (Eds.) , The development of shyness and social withdrawal (pp. 277-299). New York, NY US: Guilford Press. Wells, A. (2000). Modifying social anxiety: A cognitive approach. In W. Crozier (Ed.) , Shyness: Development, consolidation and change (pp. 186-206). New York, NY US: Routledge.